So you’ve mastered the basics of Windows 8 but now you’re keen to find out more about what Microsoft’s latest operating system can do and how you can use it in a quicker and more efficient way. Windows 8 Tips, Tricks & Shortcuts in easy steps is packed with hundreds of useful tips that will help you get the most out of Windows 8, in the familiar In Easy Steps style. The Windows 8 interface – the big new feature in Windows 8. The book begins by taking a good look at how this works and what can be accomplished with it so you will soon be able to find your way around. It all covers how to revert to the traditional desktop, plus how to combine features of the two interfaces. Keyboard shortcuts - virtually every action that can be done with a mouse can also be done with a keyboard – and very often more quickly. If you run Windows 8 without a touch screen you will find yourself employing keyboard shortcuts much more frequently than before. 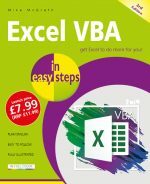 To get you up to speed quickly, this book provides a list of all the available commands; not just for Windows but for Internet Explorer as well. Customizing your PC - we all have our likes and dislikes and virtually everyone likes to stamp their personality on their PC. This book will help you customize the appearance of Windows 8. Internet tips - the Internet is a wonderful resource for information, entertainment, software and business. This book details a wide range of tips that include extending the basic functionality of Internet Explorer 10, useful features of this new browser and how to improve the efficiency with which you use the Internet. The book also looks at how to improve a browser's speed, how to search quickly and efficiently, how to repair Internet Explorer and much more. Email - probably the most popular PC application of all. Learn how to safeguard your messages, contacts and account settings, how to access your email from anywhere in the world, beat the spammers and avoid virus attacks. Searching - finding something on a well-used computer can be very difficult and take a long time. 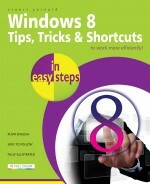 This book demonstrates how to use Windows 8 search tools to eliminate this issue. Facts and figures - how to get specific types of information, e.g. statistics that will enable you to monitor the health of your system. The apps supplied by Windows 8 provide another source of useful information; for example, the weather app provides current local weather conditions that are updated in real-time. There are many other types of app that do the same thing and this book takes a look at these apps and how to configure them. Home Entertainment Centre - how to build a Home Entertainment Centre round a Windows 8 PC and how you can use your PC as a TV/Video Recorder. Gaming is another popular computer pastime and this book will teach you how to create virtual discs of your games and play them on a virtual DVD Player for increased game performance. Synchronizing data - many people these days use several computing devices so the book shows how you can synchronize your data across several devices and how you can take your OS and software wherever you go and use it on any PC. Other tips include; how to efficiently organize data, how to run previous Windows versions within Windows 8, creating custom toolbars and much more. Privacy and Security - how to keep your computing activities private as well as highlighting the ways in which you can unwittingly reveal what you’ve been doing, the programs you’ve been using, websites you’ve accessed, etc. The book then demonstrates how to conceal your computing activities from prying eyes to ensure complete anonymity. Most people are aware of the threat to your PC from viruses but there are many more, so this book shows what they are and how to guard against them. Installation - the pros and cons of installing Windows as a new installation or an upgrade and how to carry them out. Other useful tips include how to set up partitions on a hard drive, how to set up user accounts, and how to get incompatible programs to run on Windows 8. It also looks at how to improve the performance of your computer, not just the speed at which your PC runs, but also its stability and thus reliability. It begins by detailing the hardware requirements for Windows 8 against which you can compare with your own system's hardware and thus learn if you need to upgrade it. 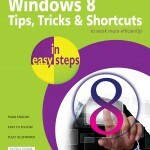 Windows 8 Tips, Tricks & Shortcuts in easy steps also contains a number of additional tips and tricks, like how to get the start button back, how to quickly repair Windows 8, how to give your PC a free tune-up, and many more, so that you can be confident that you’re getting the most out of Windows 8.